Police Senior Assistant Commissioner Charity Charamba. The Zimbabwe security forces have laid the blame for the civil unrest and violence that broke out in Harare and Bulawayo early last week on ex-soldiers and policemen who abuse military/police regalia to commit crimes. 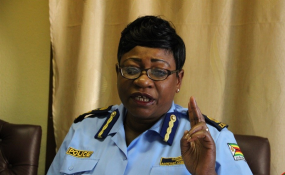 Addressing a press conference on Saturday last week, Police spokesperson, Charity Charamba said there was an increase in cases of people committing crimes while clad in military/police regalia. Charamba also warned shops selling military replica attire to abide by the Defence Act which prohibits any member of the public from putting any military/police regalia. Read the full statement by the Zimbabwe Republic Police and Zimbabwe National Army below. The Zimbabwe Defence Forces and Security Services have noted with grave concern an increase in cases of people committing crime particularly robberies whilst clad in military/police regalia. It is an offence for anyone to wear military regalia when they are not serving members of the Defence Forces/Security Services. Section 99 (2)(c) of the Defence Act, Chapter 1 1:02, and the Police Act prohibit any member of the public from putting on any military/police regalia. The Defence Act specifically provides that any person who without authority wears or uses, "any decoration supplied to or authorised use by any member of the Defence Forces or military forces or any decoration so nearly resembling such decoration as to be likely to deceive shall be guilty of an offence". Some of these uniforms worn by criminals were seized by rogue elements during the recent riots in Epworth and Chegutu. A case in point is a recent arrest of five armed robbers in Epworth; Harare on 14 .January 2019, who were using police and military regalia to commit armed robberies, after hiring vehicles from car rental companies. We are therefore giving an ultimatum to individuals who have retired, deserted, absented themselves without official leave (AWOL) from service to immediately handover uniforms either to the police or the Zimbabwe Defence Forces. All those who do not comply with this directive will be flushed out by already deployed members of the security services. We are also appealing to members of the public who have information on such people who are not serving members and are abusing military/police regalia to report to the police. Business people who sell replica military attire are reminded that it is an offence to do so and anyone caught will be arrested. The Zimbabwe Defence Forces and Security Services have also noted with concern, the misinformation campaign by the organisers of the recent riots, who are using the media to urge members of the public and business to continue engaging in the so called "shutdown", which has led to a trail of destruction, loss of life and injury to citizens. The security services want to reiterate the assurance by Government that adequate security has been put in place to ensure members of the public and businesses go about their activities without hindrance. The Zimbabwe Defence Forces and Security Services remain committed to the provision of safety and security to all members of the public. In the same vein we want to warn those bent on causing mayhem that the law will be applied without fear or favour.